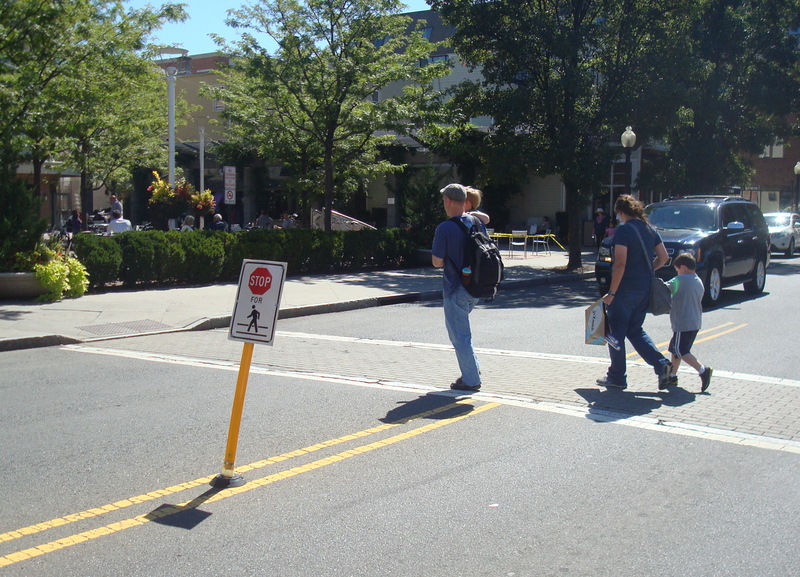 Pedestrian safety measures in downtown Princeton, NJ. (click to expand). former Borough Mayor Yina Moore promoted the “Let’s Move” campaign, and where the current Mayor, Liz Lempert, holds ‘walk and talk’ meetings with local residents. Despite the attention of elected officials, efforts to make Princeton friendlier to walkers have met resistance at the neighborhood level. Earlier this year, Council President Bernie Miller voted against an ordinance to establish sidewalks on Poe Road, in the Littlebrook neighborhood, in the face of concerted opposition by local homeowners. Dr Murthy’s policy advice ought to be taken seriously by municipal decision makers. Walking brings a huge range of health benefits, including a reduction in the risk of obesity, lower blood pressure, and prevention of osteoporosis. Princeton is a pretty friendly town for walking, but car use is still dominant. Hopefully in the future, the town can find ways to make it easier and more fun for people to get around on foot. This entry was posted in Complete Streets, People, Walking. Bookmark the permalink.